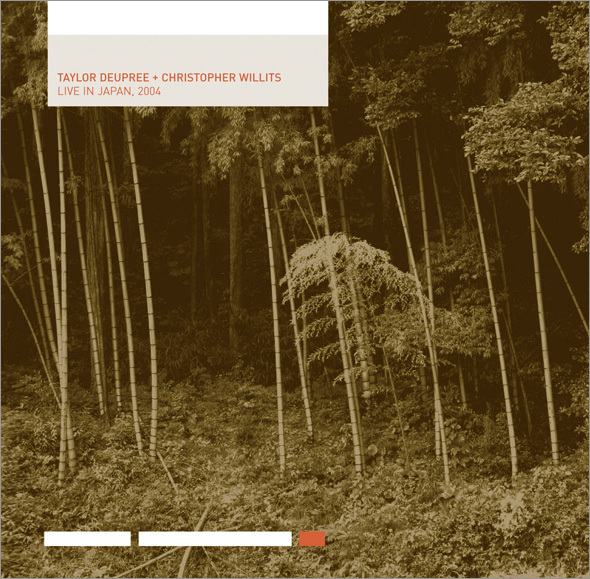 Taylor Deupree + Christopher Willits Live In Japan, 2004 is the first release in 12k’s new Limited Series. Issued in a numbered edition of 500 cds, Live In Japan, 2004 has been created as a document of Deupree’s and Willits’ performances at the Yamaguchi Center for Arts and Media (YCAM) in Yamaguchi, Japan during their 2004 tour and is being released to support their 2005 tour of Japan. It will first be made available in Tokyo on June 18th at the Shibuya Uplink Factory and will continue to be sold throughout the 9-day tour. Any remaining copies will then be made available in 12k’s online shop and at future live shows from the artists. Live In Japan, 2004 features 3 live recordings from YCAM on June 26th, 2004. The first piece is a collaborative improvisational set between the two artists, borrowing textures and styles from each of them, not unlike their previous two critically acclaimed releases Audiosphere 8 (Audiosphere/Sub Rosa, 2003), and Mujo (Plop, 2004). However, new directions are taken into pulsing and repetitive frameworks, more intense than either artist is commonly known for. The second track is Christopher Willits’ own performance capturing his signature live, folded guitar work and the third track is a micro/ ambient set from Deupree utilizing not only computer-based sounds but live, processed melodica as well as real-time room recording manipulations.